Brooklyn ... Are You Ready for Adam Morrison? The Knicks Are About to Extend Mike Woodson. Is This the Right Idea? Will the Eastern Conference Finals Get Nastier Now? 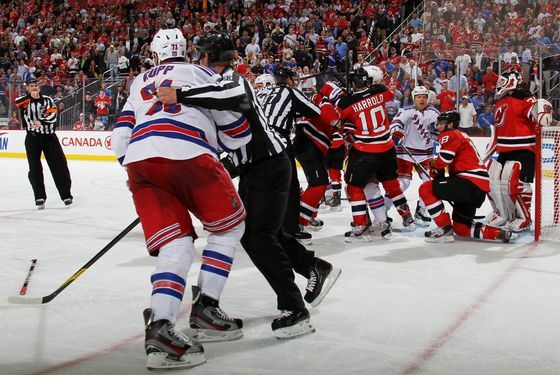 The Rangers and Devils developed some bad blood during the regular season this year, and their coaches have gone back and forth in the press more than once in recent months, so it was only a matter of time before tensions boiled over during these Eastern Conference Finals. 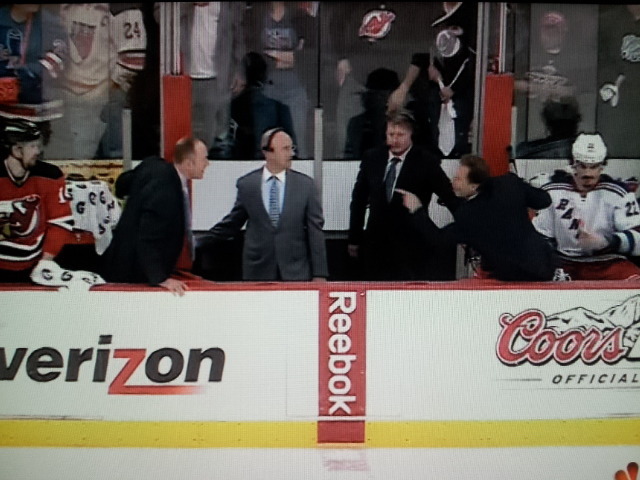 And, so, last night's Game 4 provided the types of images we hadn't yet seen through four games: Mike Rupp shoving Martin Brodeur, some post-shove scuffles, and John Tortorella and Peter DeBoer yelling at each other from their respective benches. The Rangers have already seen a series take a turn for the nasty once in these playoffs in the opening round against Ottawa. But are we seeing that happening again? Not necessarily. As far as hockey melees go, this one was fairly tame. While the image of Tortorella and DeBoer called to mind the one of Peter Laviolette and Dan Bylsma from the end of the regular season — it's not a coaches' spat if Pierre McGuire isn't standing in the middle! — the incident that led to this particular shouting match wasn't nearly as wild. The images are tailor-made for a tabloid back pages, but let's not pretend that Rupp tried to take out Brodeur with a tire iron here. Yes, Rupp makes contact with Brodeur, but the goalie falls back dramatically and kicks his leg up — a response that sure looked embellished on replays and only served to escalate the situation further. (We're not alone in thinking this about Brodeur's performance, either.) If Marty's reaction wasn't quite as dramatic, is this back-page news today, or is it a forgettable two-minute penalty tacked onto the one Rupp was already getting, followed by the type of scrum seen countless times during the course of a hockey game? Perhaps the answer is that yes, simply making contact with Brodeur is enough to turn this into a story line on the day between Games 4 and 5. But our point here isn't to focus on a single incident that we think is getting blown out of proportion today. (We've seen some chaos between these two teams this year, but what happened last night doesn't belong in the same conversation.) The question today is whether last night, and the third period in particular, is a harbinger of things to come in this series. By the time it ended, Game 4 was the chippiest game we've seen so far in this series, and while there were some brief fireworks last night, the series hasn't yet exploded into the type of mayhem these teams are capable of. And we're not sure that it will. The Rangers were responsible for starting things up last night, but we don't think this is part of a strategy to make this series nastier. That's what Ottawa seemed to consciously do in Round 1, though since the Rangers are comfortable playing a physical game, it alone wasn't enough to win them the series. In this case, we'd be more inclined to chalk it up to third-period frustrations getting the best of the Rangers and to Rupp channeling Sean Avery to mix things up with Brodeur when the game started to get out of hand. Even Stu Bickel's presence on the ice on that shift didn't necessarily guarantee a brawl; he didn't get involved until after the Rupp shove, and even then, he and Ryan Carter barely earned their misconducts. Maybe this is exactly what a frustrated Tortorella wanted to happen in last night's game, but it's not necessarily something we'll see more of. Remember, a big reason the Devils dispatched the Flyers in five games was that they played such a disciplined series. The Rangers surely know this, and so to goon things up any further could be risky. But here's the other thing about the Rangers: In these playoffs, they've proven they're not the type of team that's going to deviate much from the game plan they've had for months now. They play a certain way, and they seem to truly believe that the closer they can get to playing the platonic ideal of Rangers hockey, the further they'll go in the postseason. Tortorella might switch up his line combinations, but that's about as dramatic a change as you'll see with this team. When they struggle one night, they go back and try to play their game the next night. And while they're certainly interested in playing physical hockey, they'll want to do it within reason. These coaches have some real issues with each other, and last night's shouting match might have been inevitable. But the stakes are higher than ever now for these teams, and while we can spend the next day or so rehashing all the issues between them, one imagines the Rangers will be far more focused tomorrow night on trying to stop the Devils forecheck than they will be on trying to ratchet up the intensity of the series in the wrong way.